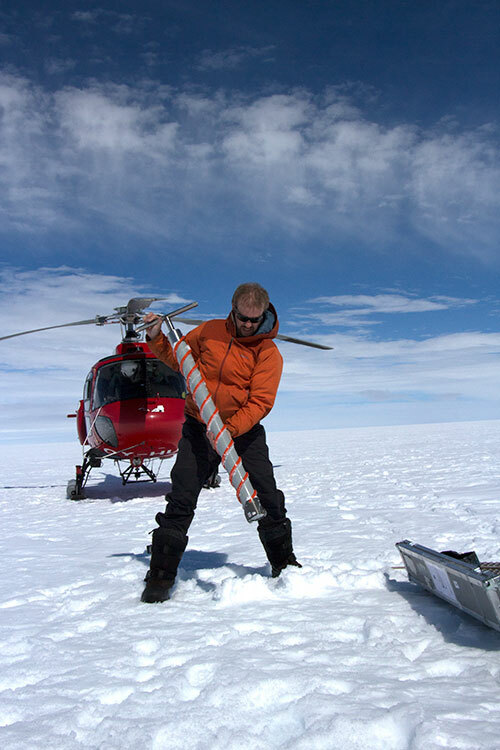 Dr. Jason Box extracts a core sample from the ice sheet, including the all-important 2012 melt layer, that will be analyzed in coming weeks and months, at labs in Copenhagen and Los Angeles. As the movie “Chinatown” comes to a muddy conclusion, hard boiled private eye Jake Gittes (Jack Nicholson) is dragged away from the scene by his partner, who counsels, “Forget it Jake, it’s Chinatown….”. 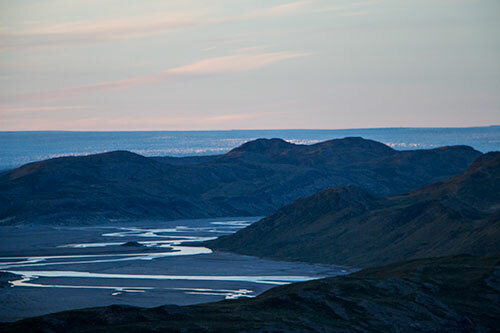 As the Dark Snow Project team reeled thru a week of miscues and disappointments leading up to the finish of our Greenland project, I kept thinking of that line, except substituting “..it’s Greenland”. In Greenland, you come with a plan. The plan goes out the window. You initiate Plan B, then plan C. Greenland shreds those. You start improvising. Then the true dimensions of your obstacles begin to emerge out of the mist. You try to stay busy. Your circadian rhythm is blown to hell, so you can’t tell day from night. Your head spins. You beat yourself up and start sorting thru shouldas and wouldas. You spin out alternative scenarios. You look at maps, satellite pictures, flight schedules and budgets. You give up. You sink into a fog soaked funk. You stare into your 5th cup of coffee and realize that you’ve spent 9 months and 17 days of your life spinning your wheels and you’re coming up with nothing – your magnificent vision is ignominiously circling the drain. About the time you realize that, is when your real project begins. 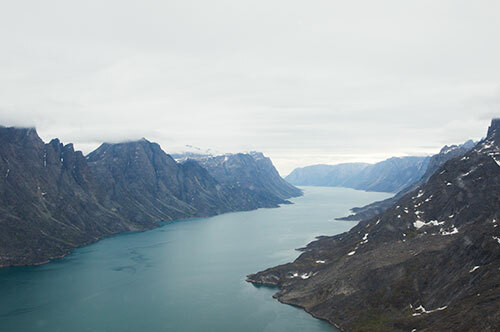 It’s also a little bit like “Lord of the Rings”, as we found out in a hastily improvised and inspired chopper flight monday morning, up the west coast from Nuuk, back to Kangerlussuaq, through 5000 foot peaks along the world’s longest fiord. Throw in a little “Forbidden Planet”, when we stopped for a quick refuel at Dye 2, an otherworldly ice station halfway to our goal. Flying for an hour through haze that reduced the blazing arctic sun to a faint smear of horizon, we finally broke through an opening in the cloud system, and spotted the tiny weather mast that marked our target location, sticking up like a pushpin at the 8500 foot elevation – the topographical midpoint of the ice sheet, a ridge of stability between east-flowing and west-flowing ice, and a place where, as far as our lead scientist, Dr. Jason Box knows, no one has ever flown in by chopper. Now phase two – the most important part. 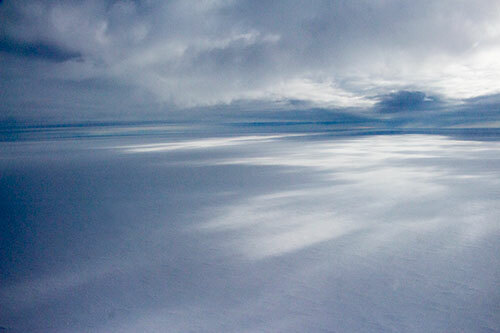 Jason Box and I flew wednesday with a large duck taped cooler of very expensive ice from Kangerlussuaq back to Copenhagen, where the cooler was quickly delivered to GEUS – the Geological Survey of Denmark and Greenland . 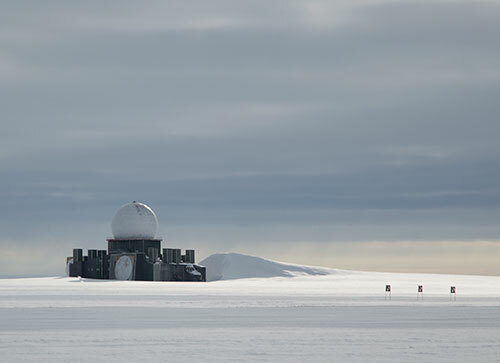 GEUS’s Dr. Marek Stibal will pull what he needs from the ice cores for biological sampling, and make arrangements to send the rest on to the Jet Propulsion Laboratory in Los Angeles. 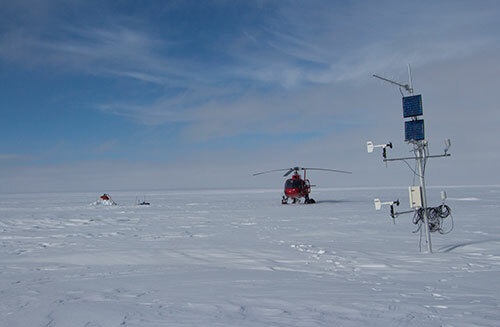 There, Mckenzie Skiles of NASA will take what remains to extract and analyze impurities, especially from the 2012 melt layer, where we hope to find some clues to what darkened the Greenland ice that year, and contributed to the massive record melting, beyond anything previously observed. Mckenzie Skiles samples snow reflection spectra high on a remote stretch of the “flat white”. I’m traveling over the next day or so. I’ll be coming away with thousands of still images, hours of video and sound, and a throbbing sensory overload hangover, from 17 days of being relentlessly hammered and crushed with constantly changing, always spectacular visuals from the Great Flat White – one of the planet’s most amazing, mysterious, and important landscapes. Well this explains the silence on your blog for the past couple of days. Good luck with the rest of the mission! Your videos are great, Collin! It’s hard to write down a Welsh accent, unless you add musical notation. Congratulations on succeeding with your key science objective, but also know that you succeeded in communicating the importance – and difficulty – of the effort.